These jackets are sold in US chest sizes. Below is AGV Sport’s sizing chart. Sleeve length measurements are taken from the shoulder seam to the cuff. We measured a random selection of the Dragon jackets and found the chest sizes to be accurate. The waist in these jackets has a little more room than the chart indicates. Arms fit snug like a race jacket (which helps keep the armor in place). The Dragon leather jacket will work well as a stand alone jacket, or zipped to compatible leather pants, it could make a good 2 piece leather suit (both short and long zippers are included). The Dragon features CE approved shoulder and elbow armor, and a 10mm memory foam back pad. Constructed of 1.2mm leather, with 1.4mm leather in the impact areas, this jacket should provide good impact and abrasion protection. In addition to the internal armor, the Dragon jacket has foam padding built in at the stomach, collarbone, and back. 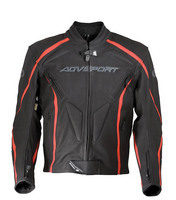 These provide a bit of extra protection, and also add to the overall style of the jacket. The Dragon should work well in cold to warm temps. There is a vest type thermal liner, and zippered vents provide some ventilation on warmer days. The vents on this jacket are fairly small, and there are no perforations, so don’t expect to be too comfortable on a hot summer day. For comfort there are stretch panels at the sides of the waist and below the arms. All of the logos on the jacket are reflective which is a nice touch – it never hurts to have some extra night-time visibility! We have taken pictures of all of the Dragon’s features here in our studio, so be sure to click the “View Larger Images” link above to check them out.